Our day was not off to a great start when we realized we couldn't download the route we wanted to take from laptop to gps. We thought it was the cable so I went to staples and bought a cord. Then we realized it was the plug on the gps itself. Back to staples and then radio shack. No luck. We figured if we found something we could spend an extra day in Jackson hole to set it up. 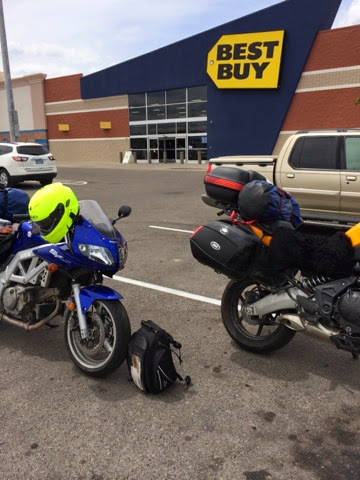 Instead we got out of our cabin right at 11am and headed to Idaho falls and the closest Best Buy. They did not have what we wanted (Garmin Zumo) so we went with a Nuvi. Our original GPS still works but you can't build and import your own route. We went through a piece of Caribou-Tarighee national forest which was nice. I saw a "motorcycles use caution" sign and started to worry. I'm still scarred from our experience in WY. it wasn't bad though. 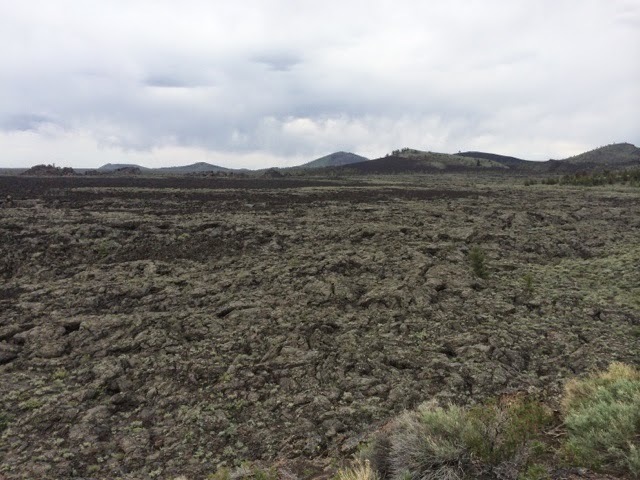 So we continued west on route 20 also called the Peaks to Craters scenic route and wound up in Craters of the Moon, ID where the landscape looked as described in the name of the town. If we were campers we would have camped there. We were headed towards Ontario, OR but instead turned north headed to Sun Valley, ID where we called it a night. I know I earlier mentioned Bonneville Salt flats. We scrapped that for now in favor of colder mountain air. Today we are headed further north along the sawtooth scenic highway. Eventually we will turn west towards the Oregon coast.